In October, we see a lot of pink promotional materials out, advertising Breast Cancer Awareness Month. You may know about breast cancer as a concept, but it’s important to know how often you should be screened, and what role you have in detecting breast cancer yourself. Different national organizations, like the Centers for Disease Control or the American College of Obstetricians and Gynecologists, have varying screening recommendations. It is absolutely necessary to talk with your doctor one-on-one about your ideal screening schedule, because your family and personal history may mean your risk factors lend themselves to a different mammography frequency. Beginning at age 40, I recommend that most women begin to receive annual mammograms. A mammogram is a low-energy X-ray that examines the human breast for masses, which leads to the early detection of breast cancer. Risk of developing breast cancer increases at age 50. In addition to age, you may also have individual risk factors based on dense breasts and genetic factors- whether there is a family history. In particular, if you have a parent, sibling, or child who has been diagnosed with breast cancer, you are at an especially high risk. Let’s say your mother had breast cancer diagnosed at age 40. I would recommend that person have mammograms and clinical screenings begin at age 30. You should always discuss any changes you notice in your breasts with your doctor. Common indicators of breast cancer include skin pigmentation changes and texture changes. Skin may appear to be eczema-like or may have dimpling, similar to the feel of an orange peel. Feeling a lump or mass in your breast may also be a sign of breast cancer, but there are also benign masses. You should know the way your breast tissue feels normally by giving yourself a thorough self-exam at the same time each month. Be sure to see your physician annually for a well visit and clinical breast exam to be sure your risks are assessed regularly. During this well visit, you will also discuss when you should consider colonoscopy (age 50) and bone density screening (age 65). There are a number of treatments available to treat the varying stages of breast cancer. In fact, according to the American Cancer Society, the 5-year survival rate for breast cancer is 90%, but the 5-year relative survival rate for women who are diagnosed with stage 0 or stage I breast cancer is close to 100%. Early detection is essential, so if you haven’t already scheduled your annual well visit or mammogram this year, talk to your doctor today. 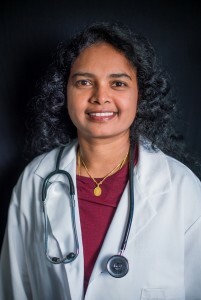 Dr. N. Lakshmi Battala, MD is an OB/GYN physician with more than 20 years experience. She joined the Drew Memorial Women’s Services staff in 2017. This entry was posted on Monday, October 29th, 2018 at 9:58 am	and is filed under Medical / Hospital. You can follow any responses to this entry through the RSS 2.0 feed. You can leave a response, or trackback from your own site.